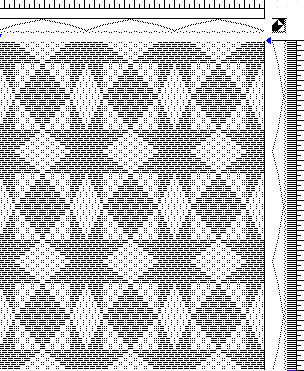 Tied overshot, often called stars and diamonds weave, evokes images of pretty weaving patterns. 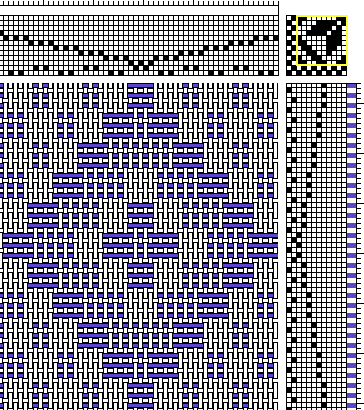 Having read several articles about it, I learned that tied overshot is well known for being a traditional Colonial coverlet weave used in Pennsylvania in the nineteenth century. It looks like overshot, but is more closely related to summer and winter. 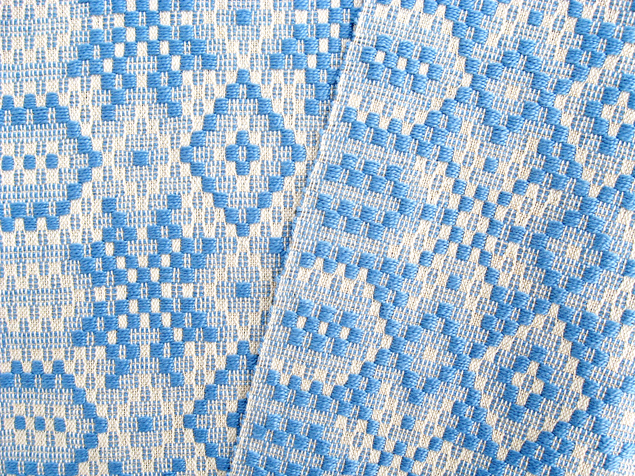 In many traditional coverlets the warp and the tabby (plain weave) weft are often thinner cotton yarns and the pattern weft is a thicker worsted wool yarn. 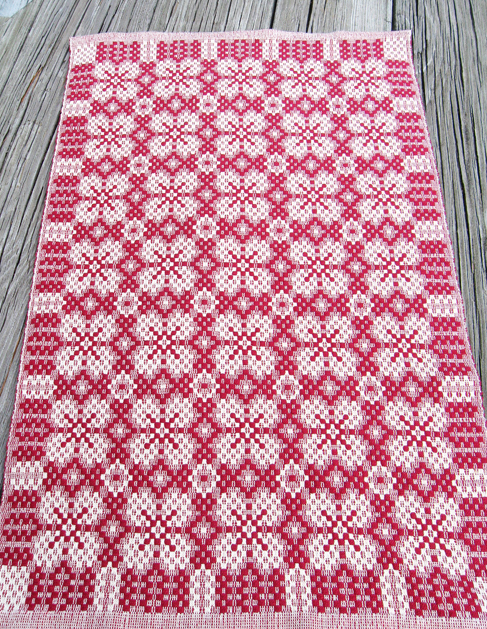 For my table runners I chose yarns that I had in my stash: thin 16/2 soy silk for the warp and tabby weft and a thicker 5/2 pearl cotton for the pattern weft. 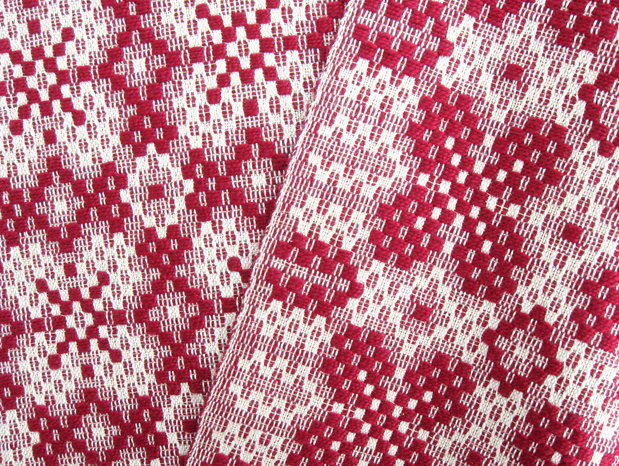 All three runners were woven on the same warp with a sett of 30 e.p.i. They were all wet finished by hand and steam ironed. I also found online a PDF version of Tom Knisely’s March/April 2006 article in Handwoven magazine, “Stars and Diamonds – for a show towel on fourteen shafts.” I think the John Landes draft was used for the towel. This is a nice article with detailed drafts and step-by-step instructions. 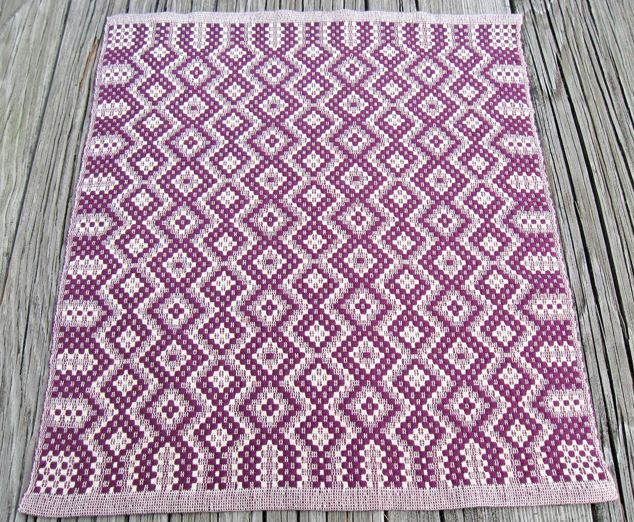 For more on tied overshot and related weaves there are many excellent articles in Weaver’s magazine issue #19 (4th quarter 1992), the theme is friendship coverlets. Hope you enjoyed this post. Until next time, I wish everyone peace, goodness, and joy in the coming holidays and the New Year! This entry was posted on November 16, 2018 at 7:42 pm and is filed under Tied Overshot. You can subscribe via RSS 2.0 feed to this post's comments. The tied overshot is beautiful! Would you please send me the WIF for the 8 shaft draft? I’d love a .wif of the 8 shaft tied overshot. Thank you so much for your detailed post, I would truly appreciate it if you would send me the wif for both the blue 12 shaft runner and the 8 shaft also. I really enjoy putting on a long warp and experimenting with tie ups, treadling variations etc. 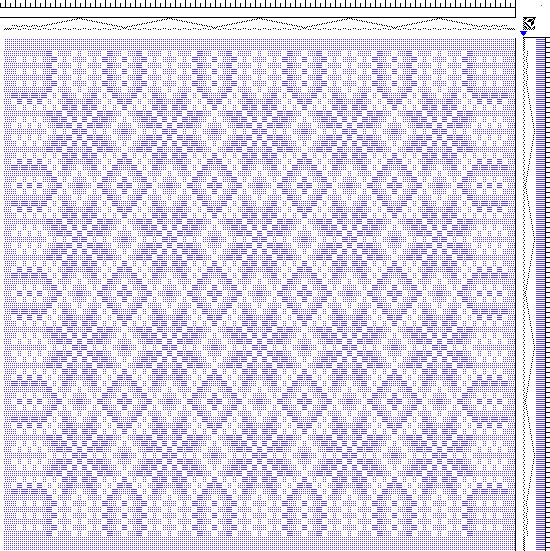 to see how many usable designs I can devise from just one threading. Margaret, thank you for your comment! I’m glad that you pointed out that there are so many variations of tied overshot that you can weave on the same warp by making changes not only in the tie-up but in the treadling too. My table runners all happen to have the same treadling but I hope weavers will experiment with the treadling too. I also want to thank everyone else who commented and I’m happy to send wif files to you and anyone else who requested them. Thanks for the inspiration. 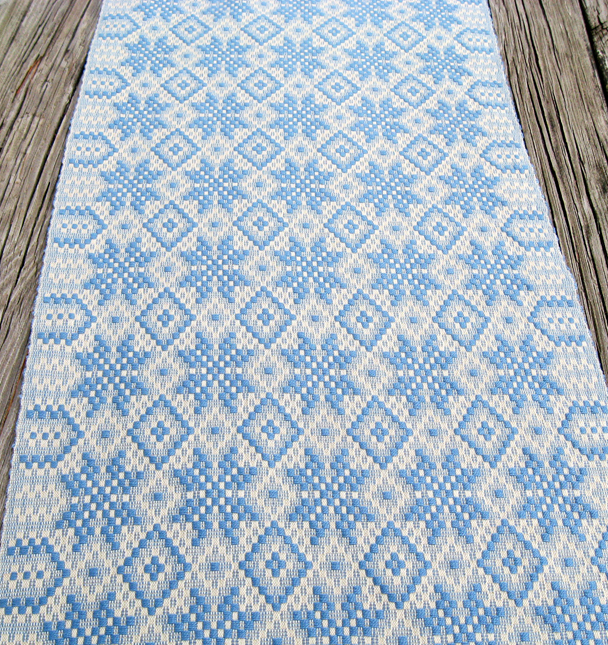 I would love to have your 12 shaft draft of the blue and white table runner. I would like your 12 shaft draft. I would love a copy of the 8 shaft draft. 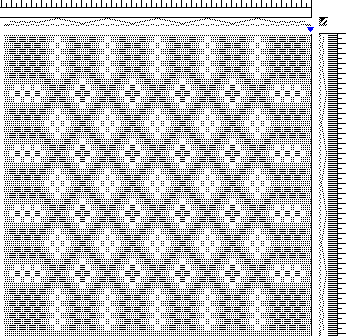 Thanks for helping me learn new weaving structures and how they work. Hi, Eva – I’d love the WIF of the 8 shaft draft. 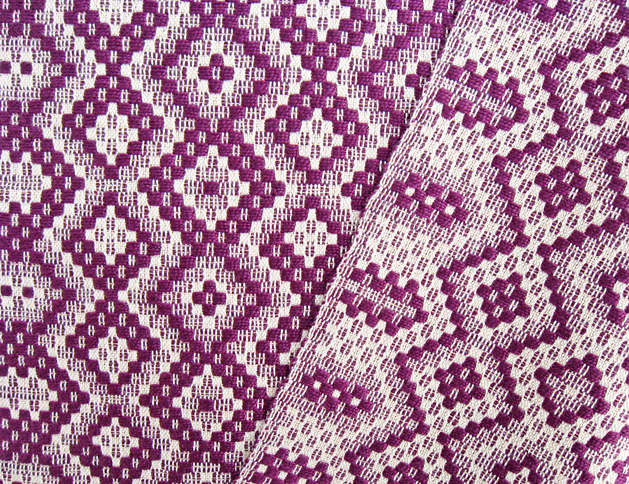 Your weaving is so inspirational! Marilynn, I will gladly send you the WIF you asked for as I have sent it to everyone who asked for it. I looked at your website and your work is beautiful! Eva, Thank you so much for the information in this post and the resources that you used. I would also appreciate the wif files for the 12 and 8 shaft designs. I have been wanting to try some traditional designs using silk and this looks like the perfect opportunity to have some fun. Thank you again for being so generous with your work.